ONTARIO, Calif. ----- Saddened by a story in the Los Angeles Times about a two year old girl in India who had died from an intestinal disease caused by the local drinking water, Rex Mehta racked his brain on what he could do to prevent other Indian children from suffering a similar fate. Approximately 25 million Indians, including three million children die each year from drinking water that has become contaminated with bacteria, viruses, and protozoa. 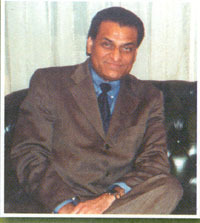 Rex Mehta is president of Business Internet Connection, Which Designs Web-Site pages for Indian businesses, both here in the United states and in India. that are then included in his interactive service on the Internet. Moved by the Times story, he began investigating the process of reverse osmosis, and the use of ultraviolet light, to purify water, "looking at pros and cons of how expensive they were," he said. purification device which guarantees the quality of drinking water in the world-wide market. The purification device is in fact three separate filters housed in a single unit that has been attached to the underside of the bottle cap. Once the bottle has been filled with water and the cap screwed in the place, the filtration system effectively blocks any impurities or contaminants. Those filtration bottles earmarked for India have been additionally equipped with an Iodinator resin, which specifically filters out E-coli bacteria, Giardia, and other harmful pathogens usually found in contaminated drinking water. For India this kind of bottle is very practical, since it does not use any electricity and is low maintenance," Mehta pointed out. "the Iodinator is a must and after six month of use, all you ever need is change the filter." On the American market the filtration bottle sells for $19.95, But Palmer through his global Technology water Company, has agreed to sell the bottle at cost, approximately $6 each, and Mehta plan is to distribute 10,000 bottles. Mehta and local cardiologist Dr. Ravi Makam are each contributing $5000 out of their own pocket to launch the project. Since 10,000 bottles only begin to address the needs of poor children in India, Mehta wants the Indian community to become involved. Through Stay on the Right Road, A non profit organization, Indian community members can make a ten dollar donation, which would cover not only the expense of the bottle, but the administrative fee as well as the shipping and distribution in India. Those individuals or organizations who donate ten bottles or more will have their name silk screened on the bottles and may designate where they want the bottles to be shipped in India. "The only thing we insist on is that the bottle be given free to the children," Mehta stated.